The organization is similar to the Gwathmey Residence, in that the public spaces, living room, dining room, and kitchen separate the two private spaces vertically. The entry, instead of being at the bottom, is by a ramp/bridge from the parking area and garage into the living or middle level of the building. The master bedroom is a balcony overviewing the double height living space and terrace, and is extended by a semicircular deck which is over the dining space below. The children’s rooms are “dormitory-like” and adjacent to a major playroom, all opening to grade at the lower level. 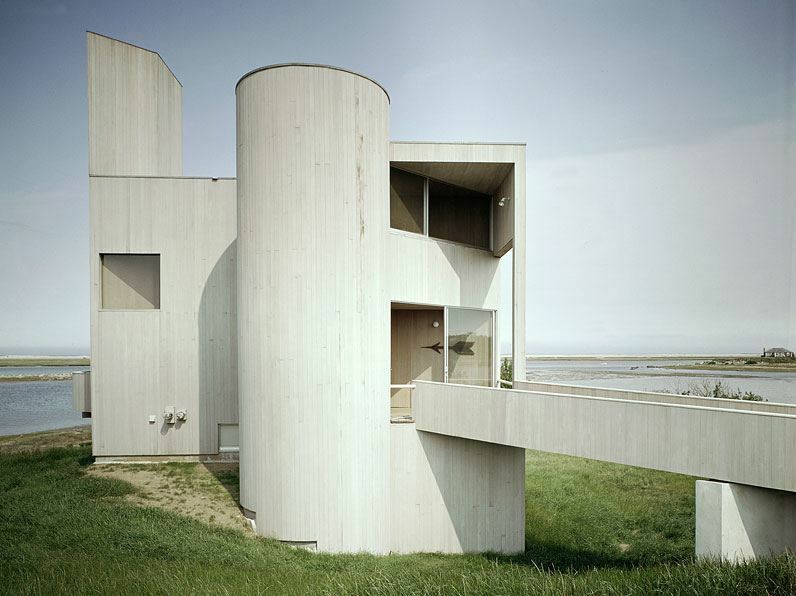 The composite plan/section overlay, the materiality, and the formal manipulation of transparency, extension and volumetric inter-relationships are similar to the Gwathmey Residence. The nautical quality is more evident because of the site, the access, and the sense of leaving the land to be surrounded by water.